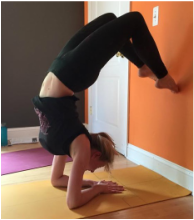 Melissa found yoga in college when she was in need of two extra credits to graduate. Little did she know that practicing under the bright lights on a gymnasium floor would ignite a spark that would over time, grow into an unwavering flame. After graduating she dabbled in yoga as a balance to her passion for running. Her inner quest for a deeper sense of self and connection to the world continued to bring her back to yoga. She would often find herself saying “if I was a yoga teacher.” When a teacher of hers announced that she would be hosting a certification course, it was as if the world finally spoke and said “you are a yoga teacher.” Melissa brings a sense of compassion, love, and strength to her practice and her students. Her hope is to inspire others to go on this journey with her to forge a deeper connection with each other, the world, and everyone’s own unique spirit.